The Washington Semester Program through American University lets students intern in Washington D.C. while taking seminars with guest speakers from the realms of foreign and domestic politics, law and jurisprudence, international business and trade, journalism, economic policy, peace and conflict resolution, and more. This program is excellent for students interested in international relations and political science. Professional application: materials are submitted on-time, are edited before submission, and are thorough and thoughtful. Students are responsible for booking their own flights. You have all day on Wednesday to move into your room and explore the campus and surrounding area. On Thursday, the program goes into full swing, beginning with orientation. Later that afternoon, individual class meetings are held. Thursday evening is set aside for settling in and for residence hall floor meetings. Throughout the day on Friday, registration (including course changes), ID cards, and billing details can be settled. You’ll usually have the majority of the day free, so you can settle most or all details before classes start. Occasionally, some of the faculty will have office hours or meet briefly with students regarding internships on Friday. Then, on Monday, the Internship Bazaar will be held on the main campus. Approximately 100 prospective internship employers come to campus to conduct on-the-spot interviews with interested students. Please have your resumes ready and look sharp! No visa is needed since this program is based in the United States. However, if you choose to participate in an international experience as part of your program, AU will assist with any visa paperwork as needed. Internship (4 Credits): The Washington Semester Program (WSP) provides students with an instant network of organizations to look through. Six to eight weeks before the semester begins, you'll gain access to all of the internships in WSP’s database that are relevant to the program you've been accepted in to. You can start your search right away, or wait until you arrive in D.C. Either way, you'll have nearly two weeks at the beginning of the semester to attend interviews and make your selection. Seminar (8 Credits): For three days of each week, you'll participate in intellectual discussion with professionals who are knee-deep in the field you are studying. You'll go "behind the scenes"; into the offices of most of the speakers to get a first-hand insider's view of the week's topics of discussion. Some of the speakers are big names and some are not, but one thing's certain, they are all major players at the local, national, and international levels who are passionate about their stance, present valid viewpoints and are invited to challenge your point of view. Research Course (4 Credits): You will enroll in an in-depth research project using Washington, D.C. as a laboratory of information. Students participating on this program will need to seek the appropriate departmental approval for all major/minor requirements and approval for General Education Requirements through Student Records. All courses on this program appear on the Rollins transcript as transfer credits and the grades are factored into the Rollins GPA. Students who successfully complete this program through Rollins will receive an official transcript from American University. It can take up to 3 months to receive the official transcript. Students must choose on-campus housing with full meal plan. Students will be housed in the university residence halls. Leonard Hall: students will live in a traditional residence hall on the main campus with corridor-style rooms and shared hall bathrooms. Rooms are triples, furnished, though students should bring their own linens. Students living in the residence halls are required to purchase a standard meal plan. The Student Association of Student Activities (SASA) organizes a variety of events for students in the school of Professional and Extended Studies at American University, including students from this program. Past events include barbecues, a Super Bowl Watch Party, Second Chance Prom, Winter Masquerade Ball, Karaoke Night, Nationals game, themed food nights sponsored by Bon Appétit Catering and more. The organization also plans community service events, fundraisers for local/international organizations and bring special guest speakers to the Tenley campus. 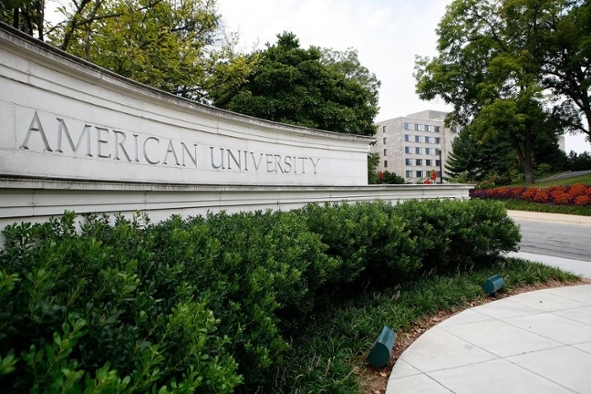 Students also have access to other American University activities, events and facilities. The program fee is equal to Rollins College tuition and fees, and room for one semester. Tuition and program administration, accommodation: residence halls or double (WISH), internship placement, complete medical and emergency insurance, meals, and orientation. *Metro fares vary according to number of stops and peak/off-peak hours. Scholarships based on financial need are available to off-set costs associated with international airfare, and, in exceptional cases, other costs associated with study abroad. Students apply for scholarships through the normal program application. Advising is offered on a walk-in basis: Tuesday-Thursday from 12pm - 2pm during the normal semester. If you are unable to make it at these times, email, call or stop by to set up an appointment. We can also put you in touch with student program alumni who would be happy to share their experience with you. You may also want to review our blog site to see what past students have said about their adventures on this program. Please Note: This program has a required advising session (30 mins) as part of the application process. Please email studyabroad@rollins.edu to schedule an appointment. China: Beijing Foreign Studies U. China: Hong Kong Baptist Univ.